A systematic review assessing autologous versus alloplastic bone for secondary alveolar bone grafting in patients with cleft lip and palate was published in 2011 and included only one randomized controlled trial comparing traditional iliac bone graft to recombinant human bone morphogenetic protein-2 (rh-BMP2). To perform a systematic review with meta-analysis on the use of secondary alveolar bone grafting (autologous bone and rh-BMP2 graft) in order to improve bone volume and height in patients with cleft lip and palate. An electronic search was conducted via PubMed/MEDLINE, Cochrane Central Register of Controlled Trials (CONTROL) via Cochrane Library, EMBASE via Ovid, and LILAC for studies published between January 2008 and September 2018. The systematic review registration number at PROSPERO was 42018085858. Only RCTs were included. Inclusion criteria were patients with the diagnosis of unilateral cleft lip and palate older than 5 years of age, radiographic evaluation (CT and/or CBCT) of the cleft area, and at least a 6-month follow-up. Bone formation and bone height by radiographic CT evaluation (preoperatively, after 6 months and after 1 year of follow-up) and length of hospital stay were assessed. Four studies met strict inclusion criteria. Autologous bone graft showed statistically significant higher bone formation after 6-month follow-up (MD − 14.410; 95% CI − 22.392 to − 6.428; p = 0.000). No statistically significant difference was noted after a 1-year follow-up (MD 6.227; 95% CI − 15.967 to 28.422; p = 0.582). No statistically significant difference in bone height was noted after 6-month (MD − 18.737; 95% CI − 43.560 to 6.087; p = 0.139) and 1-year follow-up (MD − 4.401; 95% CI − 30.636 to 21.834; p = 0.742). Patients who underwent rh-BMP2 graft had a statistically significant reduced hospital stay (MD − 1.146; 95% CI − 2.147 to − 0.145; p = 0.025). The main limitation is the high risk of bias among included studies. Autologous bone and rh-BMP2 graft showed a similar effectiveness in maxillary alveolar reconstruction in patients with unilateral cleft lip and palate assessing bone graft volume and height although rh-BMP2 graft showed a relative shorter length of hospital stay (high uncertainty level). Secondary alveolar bone grafting (SABG) remains one of the main challenges during interdisciplinary orthodontic management in cases with bone defects . Nevertheless, it is a well-established procedure for the management of patients with alveolar cleft [2, 3]. In these cases, alveolar repair is performed typically during mixed dentition phase (between 7 and 12 years old) before permanent canine eruption [4–6], whereas the timing of graft placement is based more on dental development than chronological age [7, 8]. Some of the main advantages of performing a bone graft are to provide osseous support for the teeth near the area of the cleft facilitating eruption of the teeth and to fuse the segments of the maxillary arch and alveolar ridge, enhancing lip support and improving facial esthetics [9–12]. Many sources of bone both autologous and alloplastic have been studied and compared. The question of the preferred donor site for cleft grafts has been debated for many years . Autologous bone graft has always been the gold standard of bone replacement because it provides osteogenic cells as well as essential factors needed for bone healing and regeneration. It can be taken from the patient’s iliac crest, mandible, or tibia. The choice between these sites is influenced by several factors including the surgeon’s experience, the volume of bone required, and the morbidity of the harvest area . To avoid or reduce such morbidity, surgeons are searching for a bone graft substitute. In 2007, the recombinant human bone morphogenetic protein-2 (rhBMP-2) started to be used after the Food and Drug Administration approval as an alternative to autologous bone graft for localized alveolar ridge augmentation . The identification and development of rhBMP-2 associated with a collagen sponge carrier has allowed the use of alloplastic bone graft. The bone morphogenetic proteins (BMPs) play a role in osteogenesis and chondrogenesis and are also involved in embryonic development and fracture healing . It is important to better understand if rhBMP-2 graft could represent an autologous bone graft substitute, thus eliminating donor site morbidity . 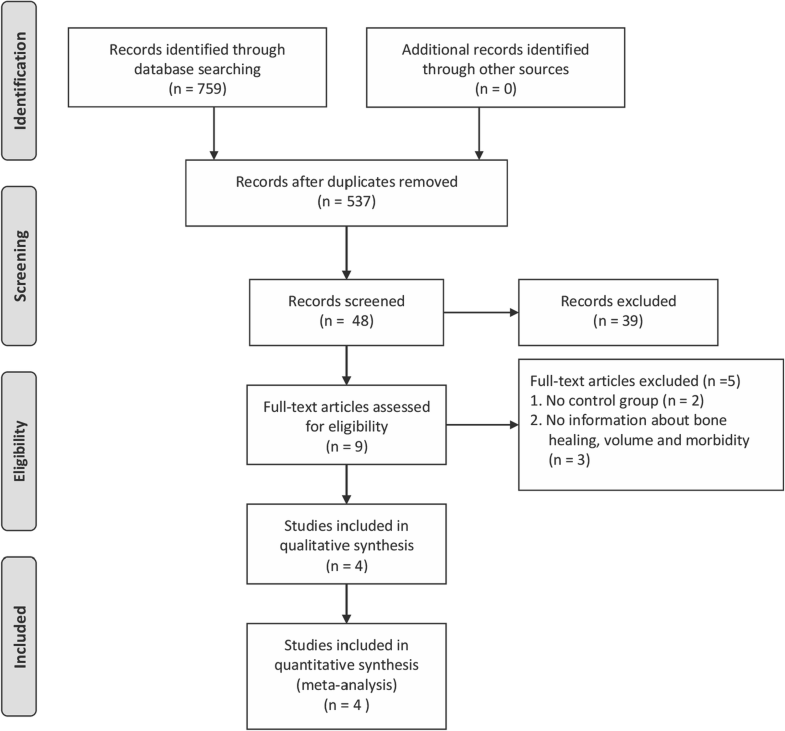 The last systematic review assessing autologous vs. alloplastic bone for SABG in patients with cleft lip and palate was published by Guo et al. in 2011  that included only one randomized controlled trial (RCT) comparing traditional iliac bone graft to rhBMP-2. Therefore, the objectives of this systematic review are to evaluate volume and bone height and length of hospital stay in patients with unilateral cleft lip and palate treated with autologous or rhBMP-2 secondary bone graft, thus synthesizing the available evidence on the effectiveness of the two types of treatment. This systematic review followed the PRISMA Guidelines checklist (Additional file 1) . The protocol was registered at PROSPERO, the international prospective register of systematic reviews (Centre for Reviews and Dissemination, University of York, UK) under the number 42018085858. This study was approved by the Ethics Committee of the University of Campania “Luigi Vanvitelli” (Prot. n. 21808/17). Inclusion criteria were patients with the diagnosis of unilateral cleft lip and palate older than 5 years of age, radiographic evaluation (CT and/or CBCT) of the cleft area, and at least a 6-month follow-up. Exclusion criteria were edentulous maxilla, atypical or non-described cleft diagnosis, and associated syndrome conditions. Primary outcomes were the radiographic assessment of bone graft volume through the 3D images and the radiographic assessment in the grafted area of alveolar bone height through the 3D images. The secondary outcome was the length of hospital stay. There was no language restriction set. An electronic search was independently conducted by two authors (AS and DC) via PubMed/MEDLINE, using the Medical Subject Headings (MeSH) terms “secondary alveolar bone graft,” “alveolar bone graft,” “cleft lip,” “cleft palate,” “cleft lip and palate,” “alveolar bone graft cleft,” “autologous bone graft cleft,” “alloplastic bone graft cleft,” “BMP-2 graft cleft,” and “bone graft cleft” for studies published between January 2008 and September 2018. A similar search was conducted on Cochrane Central Register of Controlled Trials (CONTROL) via Cochrane Library, EMBASE via Ovid, and LILAC. A secondary search was conducted by reading the reference lists of the articles meeting the inclusion criteria for eventual additional studies relevant to this review. The full-text copies were then independently assessed by the two reviewers, and any disagreement on the eligibility of included studies was resolved through consensus. Studies that did not match the inclusion criteria in this second selection phase were excluded. The titles and abstracts of all studies resulting from the search were independently and randomly assessed by the two reviewers (AS and DC) by scanning the titles, abstracts, and the keywords of the studies in the search results. Full copies of all apparently relevant studies or those for which there were insufficient data in the title and abstract to make a clear decision were obtained. The full-text copies were then independently assessed by two reviewers, and any disagreement on the eligibility of included studies was resolved through consensus. Studies that did not match the inclusion criteria in this second selection phase were excluded (Table 1) [11, 20–23]. The two reviewers independently extracted data from the included studies. Data extracted were details of the study setting, characteristics of the study samples, graft sources, and outcomes. If stated, the sources of funding of any included studies were recorded. Extracted data from the included studies is presented in Table 2. Assessment of risk of bias in included studies was undertaken independently by two reviewers. The Cochrane Collaboration’s tool for assessing risk of bias was used (Fig. 1). Disagreements in the classification were resolved by discussion. The following domains were assessed as “low,” “high,” or “unclear” risk of bias: random sequence generation, allocation concealment, blinding of participants and personnel, blinding of outcome assessment, incomplete outcome data, selective reporting, and other biases. For descriptive continuous data (bone volume, bone height, length of hospital stay), mean, standard deviation (SD), sample size, and weighted mean differences are reported. A p value of less than 0.05 was considered statistically significant. Random effects meta-analysis was performed using Comprehensive Meta-Analysis V3 software (Biostat, USA). Statistical heterogeneity was calculated by inconsistency indexes (I2), and a value greater than 50% will be considered an indicator of substantial heterogeneity between studies. The significance level was set at 5.0%. Subgroup analysis was conducted to explore the influence of the characteristics in the groups of studies, such as patients’ age, on the meta-analysis outcomes, thus to produce estimates and formal statistical comparisons across the subgroups. The grading of recommendation, assessment, development, and evaluation (GRADE) instrument assessed evidence quality and grading of recommendation strength in the included studies in the quantitative synthesis and meta-analysis. This assessment was based on considerations such as study design, consistency, directness, precision, publication bias, and other aspects reported by studies included in this systematic review. The quality of the evidence was characterized as high, moderate, low, or very low and was assessed using tools from the website http://gradepro.org . After the search strategies, 759 publications were identified, of which 750 were excluded after reviewing the titles and abstracts. Of the remaining 9 publications, full texts were obtained. After screening full texts, 5 studies were excluded. Therefore, only 4 RCTs [4, 25–27] fulfilled all the inclusion criteria. For details of the studies examined and reasons for inclusion and exclusion, please see Tables 1 and 2. The process of study identification is presented in Fig. 2. A total of 56 patients with unilateral cleft lip and palate was involved, 27 underwent rhBMP-2 graft, while 29 patients underwent iliac crest bone graft. From the 4 selected studies, 2 were conducted in Brazil, 1 in the USA, and 1 in Sweden. In 3 of these studies, the intervention group received the rhBMP-2 delivered by a collagen sponge carrier and the control group received traditional iliac crest cancellous graft. In only 1 study, the intervention group received the rhBMP-2 delivered by a hydrogel carrier. Random sequence generation: All the studies mentioned random allocation, but none mentioned the detail of sequence generation. Thus, the sequence generation was not clear. Allocation concealment: None of the included studies clearly described any allocation concealment. Blinding of participants and personnel: None of the studies mentioned whether the surgeon or participants were blinded, so blinding was also considered to be unknown. Blinding of outcome assessment: None of the studies mentioned blinding of outcome assessors. Incomplete outcome data: From all the studies, there were no reported dropouts. The only not reported data were the preoperative defect sizes of cleft lip and palate in Canan et al. .
Other biases: We did not find any other source of bias. The included studies compared traditional autologous bone graft (iliac crest) with alloplastic bone graft (rhBMP-2). They evaluated bone formation and bone height by CT evaluation and length of hospital stay after surgery. Three-dimensional CT evaluations were obtained preoperatively, after 6 months and after 1-year follow-up. Neovius et al., Alonso et al., and Canan et al. assessed bone graft volume with CT evaluation after 6 months. Autologous bone graft showed higher bone formation after a 6-month follow-up period that resulted to be statistically significant (MD − 14.410; 95% CI − 22.392 to − 6.428; p = 0.000) (Fig. 3). Alonso et al., Canan et al., and Dickinson et al. assessed bone graft volume with CT evaluation after 1 year. No statistically significant difference was noted (MD 6.227; 95% CI − 15.967 to 28.422; p = 0.582) (Fig. 3). A subgroup analysis was also performed to evaluate the influence of patients’ mean age on the meta-analysis outcome. Dickinson’s sample had a higher mean age (16.1 years) compared to the other studies. They reported that bone formation with alloplastic bone graft was significantly higher than that with autologous bone graft after a 1-year follow-up (MD 30.000; 95% CI 11.593 to 48.407; p = 0.001). 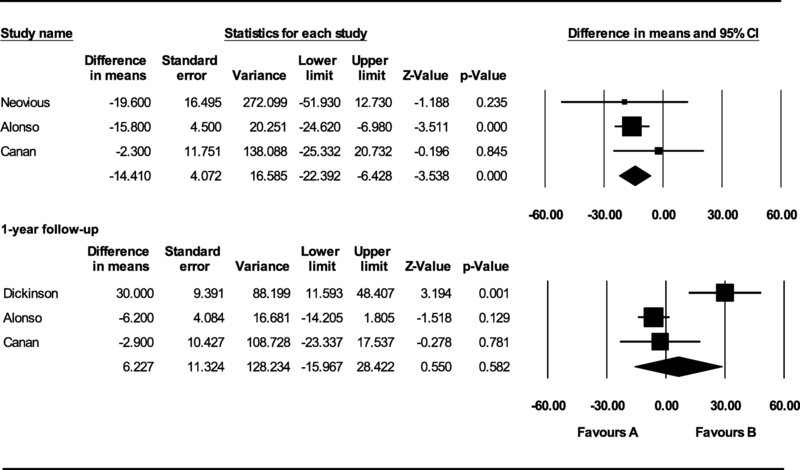 After performing a subgroup analysis without Dickinson’s data, still, no statistically significant difference was noted (MD − 0.493; 95% CI − 1.249 to 0.263; p = 0.201) (Fig. 4). Alonso et al. and Canan et al. assessed bone height with CT evaluation after 6 months. No statistically significant difference was noted after 6 months (MD − 18.737; 95% CI − 43.560 to 6.087; p = 0.139) (Fig. 5). Dickinson et al., Alonso et al., and Canan et al. assessed bone height with CT evaluation after 1 year. 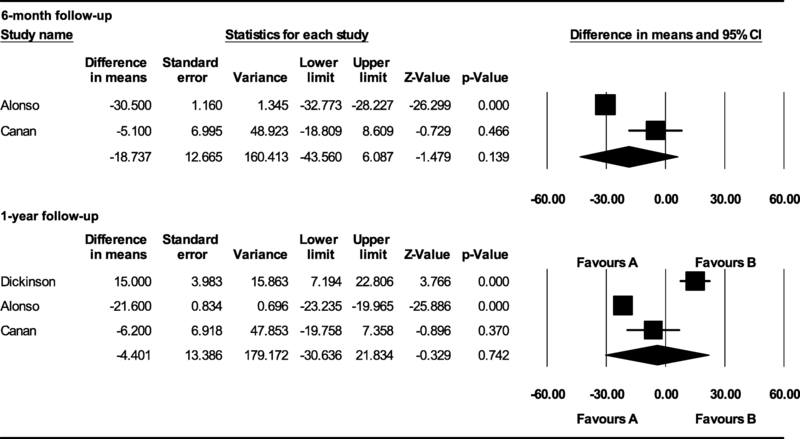 No statistically significant difference was noted (MD − 4.401; 95% CI − 30.636 to 21.834; p = 0.742) (Fig. 5). A subgroup analysis was also performed to evaluate the influence of patients’ mean age on the meta-analysis outcome. Dickinson’s sample had a higher mean age (16.1 years) compared to the other studies. In particular, considering the studies with a similar age range, the rhBMP-2 graft reported not statistically significant results in bone height than autologous bone graft after a 1-year follow-up (MD − 6.523; 95% CI − 18.694 to 5.647; p = 0.293) (Fig. 6). Dickinson et al. and Neovius et al. assessed the mean length of hospital stay after surgery. Patients who underwent rhBMP-2 graft had a reduced hospital stay, and the difference of about 1 day resulted as statistically significant (MD − 1.146; 95% CI − 2.147 to − 0.145; p = 0.025) (Fig. 7). Overall, the quality of the evidence from the outcomes evaluated by the GRADE system was assessed as low, suggesting moderate confidence in the estimated effect from the assessed outcomes. An “unclear” or “high” risk of bias among the included studies was the main factor responsible for the limited quality of the evidence (Fig. 1). Publication bias was not assessed due to the limited number of studies included. This systematic review included four RCTs [4, 25–27] that focused on the effectiveness of autologous and alloplastic SABG in children with cleft lip and palate after a 6-month and/or 1-year follow-up. Each included RCT used iliac bone as autologous donor site material and rhBMP-2 as alloplastic material. The three-dimensional radiographic evaluation with CT is the only reliable and elected method for the analysis of height and volume of the alveolar bone [4, 28]. The comparison of bone volume between autologous and alloplastic bone graft after a 6-month follow-up showed statistically significant results favoring the autologous approach over the rhBMP-2 graft, but after 1-year follow-up, the differences in bone formation disappeared. It has to be noted that the results favored the autologous bone graft when excluding Dickinson’s study , probably because it only considered patients after the eruption of the permanent canine, whereas the other studies involved patients before canine eruption. Another possible explanation is that there seems to be a tendency of autologous bone graft to lose its volume from 6 months on, most probably owing to bone resorption until the canine erupts . The assessment of bone graft height after 6-month and 1-year follow-up showed no statistically significant results between autologous versus rhBMP-2 bone graft at neither time frame. Regarding the length of hospital stay, the patients treated with autologous bone graft were hospitalized longer than patients undergoing an rhBMP-2 graft with a statistical significance. This is likely related to wound healing from the harvested bone from the iliac crest region. However, the difference of hospital stay was about 1 day; thus, it should not be considered of substantial clinical significance. It has been recommended that it may be important to find an autologous bone graft substitute, though partial, to avoid the need for a second surgical site reducing operation time, hospital stay, and postoperative pain with any related complication, thus making the procedure more acceptable for the patient . The current synthesis does not favor either approach at 1-year follow-up. The only difference is an additional day of hospital stay. No data assessing differences after more than 1 year were identified. According to the GRADE working group, the quality of the evidence in this research was graded as moderate (Additional files 2 and 3). A systematic review qualified as moderate indicated that the readers should not be completely confident that the results of this meta-analysis necessarily reflect every day responses. The review conclusions should be interpreted with caution, due to the limited number of studies included and some risk of different types of bias. Above all, the sample size of the RCTs included was small, in particular in Neovius’ study that only included seven patients in total. Thus, further well-conducted multicentric prospective controlled randomized clinical studies with larger sample size, similar treatment conditions, and continued follow-up of the two methods are needed in order to recommend the proper bone graft technique in patients with cleft lip and palate in an evidence-based and predictable way. The main limitation of our meta-analysis is the lack of adequate methodological quality among the included studies. First, each study did not describe the sequence generation, although they claimed that the groups in their trails were all randomly allocated and this might have introduced some selection bias. Second, the included studies did not mention the allocation concealment method, and neither of them clearly stated how blinding was used during the trial. Moreover, in these RCTs, the surgical procedures used for the bone graft management in each different study center were not standardized. This may have affected the outcomes, causing a risk of performance bias. Finally, all the RCTs included in the systematic review utilized the Infuse® Bone Graft with a collagen sponge with lyophilized rhBMP-2, except Neovius et al. that performed the alloplastic bone graft using rhBMP-2 with an hydrogel carrier. Hence, the results cannot be extrapolated to other alloplastic materials or autologous bone harvest areas. The absence of significant differences between autologous bone graft and rhBMP-2 graft assessing bone graft volume and height showed a similar effectiveness of the methods in maxillary alveolar reconstruction in patients with unilateral cleft lip and palate. An additional day of hospital stay for the patients was noted when performing an autologous bone graft. However, the difference may not be considered clinically relevant (moderate level of evidence). All data analyzed during this study are included in this published article and its supplementary information files and in the papers included in the references’ list. LP conceived the protocol and revised the manuscript. AS, DC, and FdA contributed to the data acquisition and interpretation. CFM and VG performed the data analysis. All authors read and approved the final version of the manuscript.